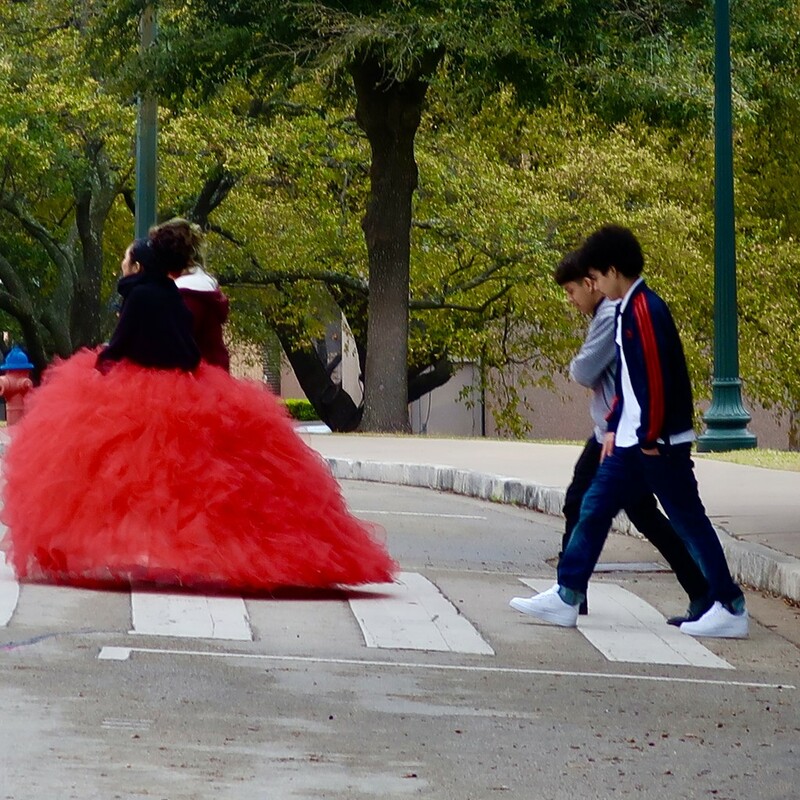 While I was at the Texas State Capitol a huge black limo pulled up and this Quinceanera queen got out with her family. Her two brothers wanted to stay in the limo but she was having none of that. When I saw her I thought how cool it is that she can have her Quinceanera photos made at our state capitol! It was cold that day, I’m sure once she went inside she took off the black jacket. This for my rainbow red today. I had to look up Quinceanera, hadn’t heard of that before. She has an eye catching dress & good for your challenge. I've heard about this but only because they have had this in some tv shows. Personally I think it is a little excessive but to each his own. Certainly an eye catcher and fabulous red. I haven't hear of this, not something we do in this country. That dress is huge. That is an impressive looking skirt and a great capture for red. I had never heard of this and like @carole_sandford I had to google it - - gosh 365 is an eye opener ! - never to old to learn something new ! Not to my taste -but an excellent and unusual find for the red challenge ! Now that is one celebratory outfit! I had to Google as well. I'd never heard of this celebration. You've captured a lovely moment in a young girl's life. Thanks for ALL your recent favs! I feel very honoured. Love the bright red dress. Have a feeling the brothers weren't as thrilled as she must have been. I didn't know what Quinceanera was either, so I Googled it. I learn so much on 365. I guess the boys weren't thrilled by the event. Good catch- that is some hoop skirt! Wow... that's quite the dress! Nice capture! A new word and a new custom! Rather nice I think. It would get pretty expensive if they had to have new outfits for graduation too!! @maggiemae - and expensive for family of many daughters !!!! It is such a big deal and wonderful she could have her photos at the Capitol.